As of this writing, frost has not yet struck; as of your reading, it probably will have. Following that event, I will remove all dead plants. I’ll grasp the tops of smaller plants, such as marigolds and basil, give them a twist to sever the smaller roots, then lift and toss the plant into a waiting garden cart. If I tried to do that with old pepper, tomato, or okra plants, they would laugh at me. I lop off the bulk of their tops, then cut around the plant with a Hori-hori knife so that I can lift the remaining stem and main roots out of the ground. In either case, my goal is to remove everything but the smaller roots. Left in place, they’ll rot to add organic matter to the soil, leaving behind channels to let air, water, and creatures move through the ground. Even now, before frost, cleanup is well under way. Tomatoes are spent; I cleaned them up yesterday. Beans are spent; I’ll clear them away today. Leaving bean roots in the soil is like sprinkling organic fertilizer from the free nitrogen they gathered from the air. Along with garden plants, weeds also get cleared away, again removing only top portions and the main roots. Small roots don’t have the energy to re-sprout. More than just looking neat, the cleaned up garden is — to my eye — ornamental. Think of the calm beauty of Zen gardens, some of them little more than boulders and raked gravel. Mine is wood chips (in paths) and raked soil. Well, not really raked soil. Bare soil looks ugly to me because I know it’s too exposed to rain and wind. So as soon as I’ve cleared a bed, I immediately put a blanket on it. Before the end of September, that blanket was oat seed topped with an inch of compost. Those beds are now lush strips of green. 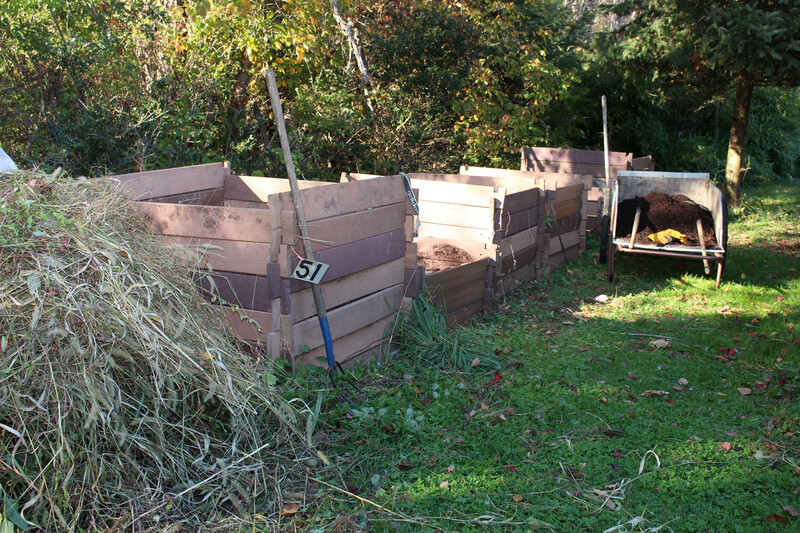 Post-September beds get blanketed with just an inch of compost. It’s roughness helps protect the surface, and next spring I can sow seeds or plug transplants right into it. That much compost is all the nourishment plants will need for the whole growing season next year. And then there are the beds still green with carrots, turnips, endive, lettuce, kale, and other cold-hardy plants. I’ll dig the root crops, for storage, at my leisure. The others, we will eat, also at our leisure. All that stuff that I am clearing out of the garden is going right into the compost pile. Yes, everything! I’m occasionally asked if I put leaves and stems that are infected or infested with blight, aphids, or other pests into my compost pile. Yes! Everything goes into the pile. I contend that if you looked closely enough (perhaps needing a microscope) at almost any leaf, stem, fruit, or root, you’d probably find some evidence of a “bad guy” on it. No matter. The combination of time and temperature within any compost pile does them in. This time of year, piles build rapidly. By paying attention to water and air within the pile as well as the balance of high nitrogen materials (manures and lush greenery such as vegetable plants and young weeds) and high carbon materials (old, browning plants, wood chips, autumn leaves), I’m able to get my compost piles up to 160° F.
Soon, cooler temperatures combined with less stuff to feed the pile makes for cooler composting. I let these piles “cook” longer, the longer time making up for lower temperatures. I’m going to shave now. This entry was posted in Flowers, Fruit, Gardening, Pests, Soil, Vegetables and tagged cmpost, garden cleanup, no-dig. Bookmark the permalink. Trackbacks are closed, but you can post a comment. Does increasing organic matter increase cation exchange capacity? Thanks for your time. No, the opposite. One of the benefits of increasing organic mater is the great resulting increase in cation exchange capacity. Organic matter can have a 4 to 50 times higher CEC per given weight than clay. This was my first year trying the techniques from your Weedless Gardening book, and I have to say they were extremely successful. We set aside dedicated walking paths and covered them with newspaper and a few inches of wood chips from a maple tree that arborists were cutting down nearby. My concern is whether the wood chips will serve as a hospitable environment for overwintering bugs and their eggs, and whether I should do anything about that. That seems like a reasonable possibility but in my experience, and that of many others, it just doesn’t happen. I use the techniques from my book and have done so for decades, and have hardly any pest problems in my vegetable gardens. The main insect pests are flea beetles, sometimes, and cabbage worms, and even they are not serious. That’s great news, thanks for the response. How do you manage your cabbage worms and flea beetles? Towards the end of this season, the cabbage worm decimated our kale and mustard, then started on the brussels sprouts. I was able to stop it dead in its tracks using a single application of Bt spray (Bonide Thuricide), but was wondering if there were any other cultural practices that I might use. As for flea beetles, they were worse this year than ever on our eggplants, setting them back about a month. I brought them back from the brink through daily hand-picking and squashing the flee beetles, but was interested in more effective, early control for next year. So far I’ve read of interplanting with Chinese Southern Giant Mustard, radishes, and marigold. Also, kaolin clay spray. Do you prefer any of these methods, or others? There are many methods to kill any pest. I use Bt 2 or 3 times a season on brassicas that get too heavily infested wit cabbage worms. For flea beetles, I use early season row covers. This year, a few eggplants never got covered but had very few flea beetles. Why? Who knows? I wonder if your statement ” I let these piles “cook” longer, the longer time making up for lower temperatures.” is really true. Based on the information I have seen cold composting does not seem to kill pathogens. If you look in Joseph Jenkins excellent book, The Humanure Book, he has charts and tables that show the relationship between time and temperatures in killing pathogens. As an example, a number of pathogens are killing within an hour at 140°F. ; at 122°, 1 day is needed; at 106°, a month to a year. No, there is no source for information about the bin construction. It’s pretty straightforward, though. Boards notched a couple of inches in from the ends so they can interlock when they stack. Notches are slightly wider than board thickness (about 1/8″) and a depth 1/4 times the width of the board. For contact with the ground on all 4 sides, you need to rip one completed board to half-width. The boards are made of “manufactured wood,” such as Trex an other materials used for long-lasting decking. I’m interested in the manufactured wood idea for compost bins. Is there any need to be concerned about chemicals leaking from the wood into the compost? Thanks! I don’t think there should be a concern. If chemicals leaked out, the manufactured wood would presumably degrade or fall apart, which it doesn’t do. Good question. Except for nitrogen, the amount of nutrients should be the same. 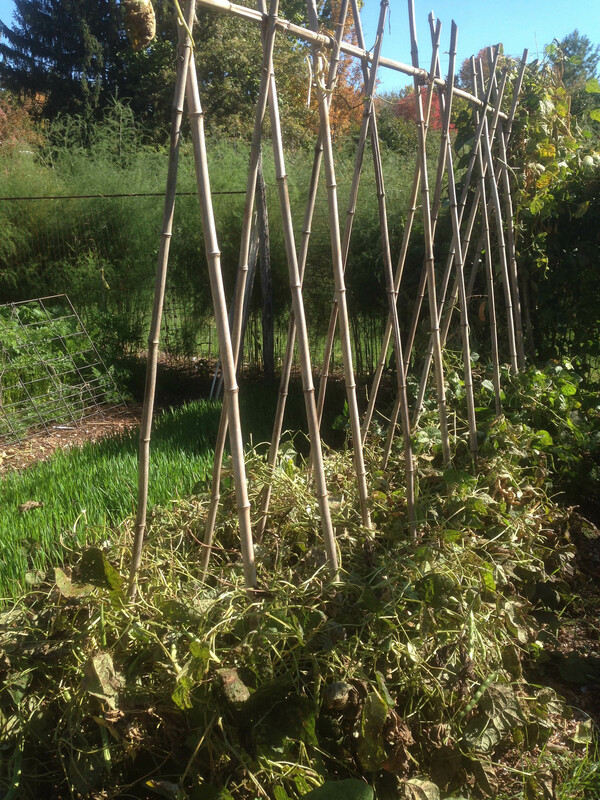 (If the vegetation is vegetables, of course, some nutrients are removed off-site as harvest.) As far as nitrogen, it would also be the same if the compost was managed so as not to lose nitrogen — by having sufficient carbonaceous material to combine with the nitrogen and making sure moisture and air were in balance. All-important organic matter should also be the same, with proper management. The advantage, to my mind, of composting, is that the ground does not have to be covered with a tarp (exposing it to the benefits of rain, snow, and temperature change), and compost produces a material potentially free of weeds and pathogens, and you can plant immediately. Also, I enjoy making compost.